The longus colli and capitis muscles prevent anterior gliding of the atlas in relation to the occiput, as well as preventing hyperextension («hinging») on the cervical spine. They are therefore very important structures to be aware of when treating atlas and neck dysfunction. 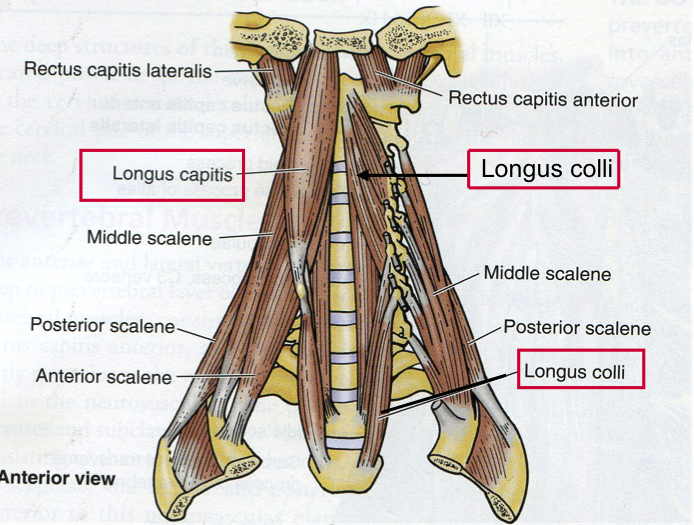 The longus capitis extends from the skull and down to C6, while the longus colli spans from the C1 and to the T3 vertebrae. Because they control cervical hyperextension, habitual (postural) hyperextension and hinging on the cervical spine will cause them to inhibit. Therefore they are usually weak and need to be strengthened significantly. Between the SCM and the anterior scalene, lies the phrenic and vagus nerves. These autonomic nerves control an array of functions in the body, such as hiccups, coughing, heart rates, etc. The vagus nerve is also referred to as «the wandering nerve» because it is unique in innervating almost all of the organs in the abdomen, controlling many autonomic tasks. In addition to these nerves, the carotid sheath containing the internal jugular vein and internal carotid artery also resides, as the main blood suppliants for the brain. If you recall, the sternocleidomastoid and suboccipital muscles are the ones that mainly extend the head, and of course these muscles will become inhibited and atrophied as the years go by without them being properly utilized. Sadly these muscles have gotten an infamous reputation for being «over-active and tight», but this could not be further from the truth. Seeing therapists needle and massage these muscles, only to, potentially exacerbate the patient’s dysfunction down the line (many get this ‘treatment’ for years on end). Usually though, the underlying cause and exacerbative factor of the atlantal instability, will carry many symptoms on its own. Such underlying causes may often be whiplash injuries or extremely poor postural habits and/or dental occlusion, over time leading to forward head & generally poor posture with neck «hinging», thoracic outlet syndrome, cervical disc herniations, vertebrobasilar insufficiency (from TOS), headaches, muscle imbalances and muscle pain. With regards to the eyes, they control dilation and constriction of the pupils, and may thus affect vision, concentration and so on. Moreover, it has been documented that both tinnitus and ocular impairment may occur post whiplash injury. It may even explain why the term «book worm» came into play; meaning, the child’s maladaptive vision may be caused by improper cervical postures, which in turn cause irritation of the cervical ganglia. The latter, though, is hypothetical, but not so far fetched in my opinion. I cited a somewhat relevant study below, where kids with myopia (near-sightedness) and hearing loss (hearing loss has also been somewhat associated with sympathetic disturbances (Bielefeld & Henderson, 2007)) had a tendency to have poor craniocervical postures. It is, however, unsure whether or not the poor postures occurred first. It is common to have some asymmetry. Sometimes the perceived «misalignment» may even be bone (osseous) anomalies, and not at all misalignment! Thus, use discernment and common sense while evaluating and treating asymmetries. It is also my impression that many chase extreme detail with regards to minor issues, such as a minor hip height difference, leg length, or femoral rotation. Although sometimes important, it seems to me that more important principles are often neglected in this process, especially in the sagittal plane, such as ignoring proper pelvic extension, removing the cervical hinge and so on; things that are of much greater importance. Working on minor issues while neglecting or being oblivious to more major problems, will not yield optimal results, in my experience. I have seen a lot of patients that have received so-called postural corrective «cures», both by dentists and atlas correction practitioners. Yet when I examine them, their posture is still way off, they’re still in pain, and muscles have not adapted to any corrective what so ever. I do think that most of these practitioners believe in their approaches and that they genuinely want to help their patients, but I also think it’s very naive to believe that a single correction to one joint (be it the jaw or the atlas) will resolve all of the body’s problems. I hope I have made it clear in this article how deep these problems really go, and that they must be, in my opinion, individually addressed for optimal results. One of the reasons this occur, is that the measurements for the atlas joint that many practitioners use, do not account for atlanto-occipital torsion. Thus, a practitioner may find himself «correcting» the A-A joints, unaware that the A-O joint is extremely misaligned. This can be EXTREMELY DANGEROUS and is why I do not recommend upper cervical manipulation for anyone with possible A-O torsion. I am writing this, not to mock or bash anyone, (I sincerely believe that most health professionals do try their best to help their patients), but rather to shed light on what I perceive to be obvious lack of knowledge and measurement criteria with regards to «moderate» (i.e non-acute) torsions of the atlanto-occipital joints. If such criteria existed per this date, it is unlikely that I would be able to point out an obvious torsion that was missed by several atlas specialists. Posture, movement patterns, and muscles will need to be rehabilitated. It is hard work, but you will be repaid greatly if you do a good job. I have seen it happen time and time again, on cases deemed to be «impossible to treat»! I have resolved whiplash injured patients with more than 20 years of pain using this protocol. That’s not to brag, just to show that it can be done if the patient gets the [correct] job done. There is almost always a solution! With regards to correcting and tractioning the A-O joint, one needs to understand that we do not play around with the bones that hold the cranium. Maltreatment of this region can, in utterly worst case scenarios, cause serious injury such as stroke and death. It is not a simple «pop» and we’re back in action. Such a pop could potentially dissect the vertebral artery and be fatal. Patients must NEVER play around with atlas corrections, and qualified practitioners must use a high level of caution. The side that the transverse process is identified to be anterior to the mastoid process on, is also the side you’ll also want to exercise the levator scapulae on. You can also traction it to immediately alter atlantal alignment, by having the patient gently raising and protracting their shoulder (to engage the L.S. ), and then the practitioner simultaneously pushes the head diagonally forward to the opposite site while twisting it contralaterally. It is a static pull and no significant movement should occur, hence you’re just «pulling» the levator scapulae and using it to twist the atlas back. Be aware though, that this should only be done if there is a light misalignment. If there is severe misalignment, ALWAYS refer the patient out to a radiologist first to take ultrasound of the cervical vessels, to ensure that you absolutely do not risk injuring the patient. You do NOT KNOW whether or not any of those vessels are compromised before you start working on their neck. The outlined protocol for correction in this article is quite safe, as it’s a muscular traction and not a pull on the joint’s ligaments. However, the vertebral artery can rupture upon mere sneezing, in patients who are greatly predisposed to injury («the last drop»), and you really do not want your treatment to be that last drop. Get the patient checked out first, if it looks bad. Because most prolo-practitioners are afraid of hurting neck injured patients, they dare not to inject their neck, even when it’s ultrasound guided. I think a «the last drop» mentality is the cause of this, as they perceive such clients as fragile, which I can understand to some degree, because they often are fragile. In Europe it’s hard to find therapists who will inject the upper cervical. I do know that several American clinics do so, though. This is most likely a multifactorial problem and thus I don’t think it has one etiology. MRIs are usually noted as «normal» in patients with chronic, idiopathic pain. It depends who you ask and what you look for. Upper cervical facet joint subluxation and jugular vein compression can be visualized on typical capital MRI, however this is rarely if ever done (Goel 2015, Higgins 2015, Larsen 2018c). Geoffrey: These symptoms are multifactorial and its detailed explanation not feasible as a reply in a comment. Book a skype session if you want specific answers. In general, atlantoaxial instability is widely overdiagnosed amongst «alternative» practitioners, and resolving it (which cannot be done by manipulation!) will rarely resolve any non-vasculogenic tinnitus or other problems. The most common causes of ETD are vagus nerve and cervical sympathetic ganglia irritation in my experience. You can read about these issues in my articles. Takk Kjetil. Hva angår Skype er budsjettet mitt nokså stramt akkurat nå, så vi får se. Jeg vil imidlertid kommentere at etter å ha lest dine fascinerende artikler så har jeg prøv å være mye mer oppmerksom på min kroppsholdning, spesielt hva angår nakken. Jeg har lenge vært oppmerksom på at jeg har markert «forward head posture». Det er mulig at det bare er innbilling eller ønsketenkning, men synes jeg opplever at når trykket i venstre øre kjennes som verst, kan jeg oppnå en liten bedring ved å innta en bedre stilling, dra hodet litt bakover og oppover og kanskje snu hodet LITT fra side til side. Slik jeg ser på det, styrker dette min overbevisning om at problemet med det eustakiske røret er på en eller annen måte forbundet med klemming av nerver, og IKKE, som to ØNH spesialister har påstått, at jeg hadde ørebetennelse som barn! Jeg skal lese gjennom denne artikkelen og den om Vestibular impairment igjen. Jeg vet at du har noen forslag til øvelser her og på YouTube, og skal prøve å prakisere disse litt mer systematisk.